After he was born I found myself worrying about all sorts of things, including the affects of Polycarbonate (found in plastic bottles) on his little body. Admittedly though I was intimidated by switching to glass bottles from the standpoint of price and the fact that glass breaks, and Connor is not gentle on his bottles at all. 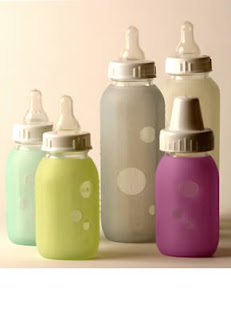 In the first six months Connor rarely used a bottle as we were still breastfeeding but as he started to wean himself I decided it was time to revisit the glass bottle debate and started doing some research. Thats when I happened across Silikids! Silikids offers an array of fun and colorful Silicone products for babies. Including bibs, knee pads (for crawlers.. I really want a set! ), and these glass bottle sleeves. The sleeves were just what I was looking for as they not only look cool (I especially LOVE the dots), but they protect the bottle from daily life, including those ocassional drops. They are very reasonably priced at $10 for the 4oz and $12 for the 8oz as you not only get a Siliskin but you also get a EvenFlo glass bottle! We have been toting around our Silikid bottle & Siliskin for a few weeks now and I am happy to report both are still doing great even with Connor's new obsession of throwing his bottle once he is done (onto the hardwood floors I may add). What I love most about the glass bottle is that it comes clean so much easier than my cheap plastic bottles, not to mention no stinky bottle if it doesn't get cleaned right away. The Siliskin is easy to remove and reapply and I just throw both in the dishwasher after each use! Visit Silikids and check out their online shop!